Pro3rd 3D Cinematic is a collection of 30 professionally designed Lower Third Titles. Pro3rds have numerous animation options that can be combined to create truly unique animations. Customize every element of the preset such as font, color, size, scale, position and more all directly inside of Final Cut Pro. 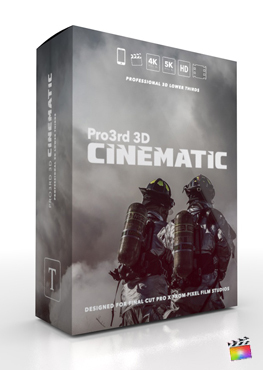 Introduce a new level of professionalism with Pro3rd 3D Cinematic.